San Sebastián, or Donostia as it is known in Basque, is a city located in a northern region of Spain known as Basque country. The Basque people, whom also live in neighboring France, can trace their origins in this region back to 2200 B.C. They speak their own language, celebrate their own traditions, and practice unique culinary traditions. In many ways, visiting the Basque country feels like traveling outside of Spain. The food and libations in San Sebastián are reason enough to visit this alluring coastal city. San Sebastián is one of the cities in the world with the most Michelin restaurants per capita, which stems from a rich tradition of living off both the land and the sea. The oceanic climate is in part what makes the food that comes from here unlike anything you will find anywhere else in the world. True Basque food relies on seasonal and local products, meant for consumption when they are at their peak freshness. When the Basque cook, they cook for themselves and for one another – not for ratings. Thus, the cuisine stays authentic to its true self. 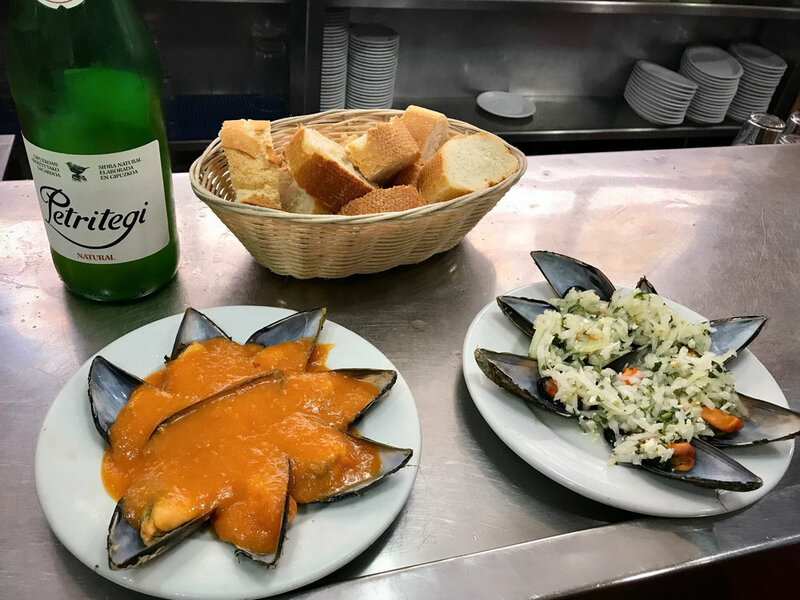 One cannot even begin to understand the local culture of San Sebastián without understanding the gastronomical culture. 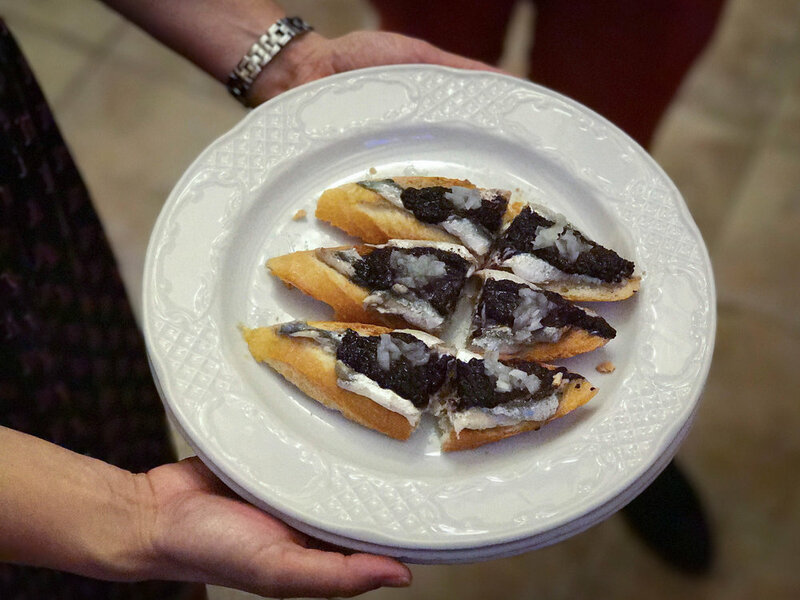 Fortunately, the "Ultimate Pintxos and Wine Tour" with Devour Tours in San Sebastián provides the perfect introduction to understanding why the Basque people take so much pride in their food and libations. Those who have eaten Spanish food before are likely familiar with tapas, which are small plates of food meant for sharing. However, the Basque do not eat tapas - they eat pintxos. Before commencing our pintxo tasting, Courtney, our stellar tour guide of the evening, gave us a proper introduction to the social culture surrounding pintxo bar hopping. The word pintxo derives from the Spanish word pincho (pinchar in the infinitive), which in English translates to “I pierce”. 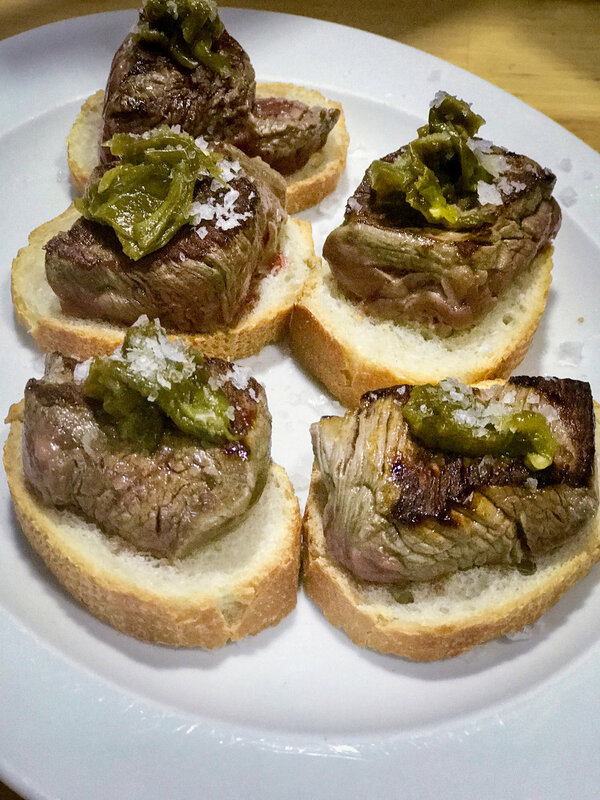 True to the name, pintxos are individually-sized bites. However, some pinxtos are stacked so high with ingredients they certainly require multiple bites. 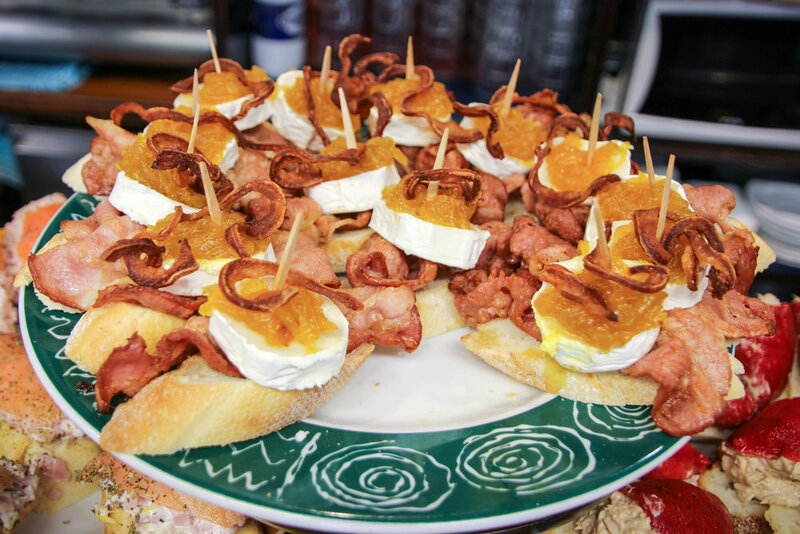 Pintxos are typically served on a slice of bread and pierced with a toothpick to hold it all together. No matter the pintxo, it should be easy to pick up with pincer fingers and eaten while standing with a glass of Basque cider or wine. Before commencing our pintxo tasting, Courtney, instructed us on how to hold our own at a pintxo bar by laying out three ground rules: (1) Don't be intimidated: the bars can be packed, but there is always room for one (or two or three etc.) more (2) Get real estate: you need to order from the bar, so don’t be afraid to squeeze your way to the bar to order or grab your pintxos (3) Throw all of your rubbish on the floor: this is also a good litmus test for a local versus touristy bar. At our first stop, we entered an unassuming restaurant that specialized in mussels. The mussels served are fished by the family members themselves and ready for locals at 6pm when the doors open. Yes, things start and end late in the Basque Country. Following Courtney's instructions, we mustered up the courage to enter the packed bar and made space among the locals at the countertop. Courtney ordered the mussels prepared two different ways. We first tried the mussels in tigre (tiger) sauce, which is a house-made tomato sauce. We also shared the mussels vinagreta, which were served with sweet spring onions, garlic, parsley, extra virgin olive oil, and vinegar. The onions did not overwhelm the dish at all; on the contrary, their sweetness balanced the mussels’ saltiness and the vinegar’s acidity. We paired the mussels with some Basque cider. With over 200 varietals of apples, the Basque country is very famous for its cider. Without the additives of carbon or sugar, Basque cider is neither sweet nor bubbly. Truly something unique to taste! The cider is poured up high not only for dramatic effect, but also to aerate the cider as it leaves the bottle. Seafood prevails in Basque gastronomy due to the long seafaring history of the Basque people. Among the first to catch whales and cod fish commercially, the Basque dominated this commercial trade for centuries. The Basque also used their ability to fish in cold and treacherous waters to negotiate political independence. The struggle for autonomy continues in Basque country to this day. There are seemingly endless varietals of ham in San Sebastián, but Courtney guided us to the best of the best: acorn fed Iberian ham. These black Iberian pigs graze the land for years, but for the last months of their life they gorge on a strictly acorn diet. An acorn diet creates a chemical change in the pig, converting the fat into a richer and nuttier flavor. There are many steps to processing the ham. One critical step, which comes at the end, is called the resting period. Here the leg of ham is hung to dry by its black hoof for up to 5 years. During this stage, the ham continues to lose moisture. As gravity does its work, fat and moisture drip down into the cone left dangling at the bottom of the leg, while the aroma and flavor profile continues to develop. 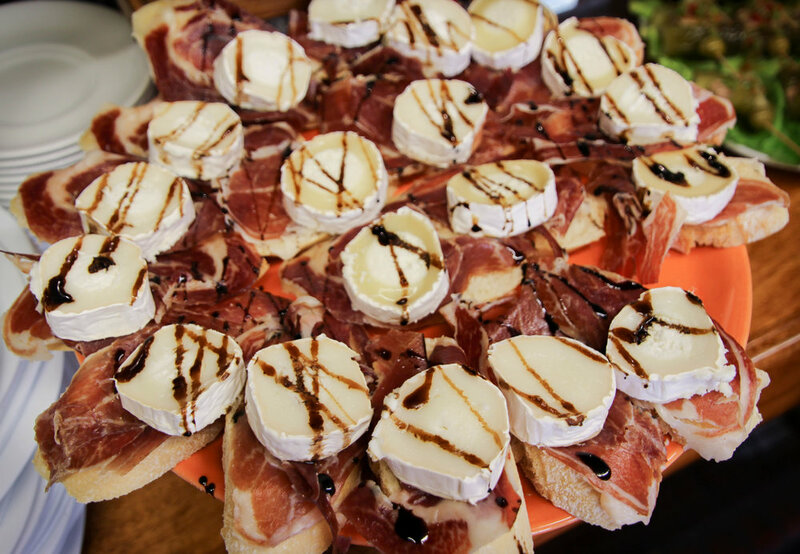 Iberian ham is a supreme delicacy in the Basque country and it is typically found at special celebrations. Some companies will even give a leg of this prized ham to an employee at the end of the year instead of a cash bonus! This is the world's most expensive ham and a whole leg of it can cost $2,000. Slicing the ham into thin slivers is a learned craft that can take years to perfect. On our gourmet food tour, we stopped at a boutique shop to indulge on this thinly sliced ham so we could gather first-hand experience as to understand why Basque people go crazy for this revered swine. An art replica sprinkled throughout the city is Pablo Picasso's Guernica. This painting depicts the neighboring Basque city of Guernica, which was bombed by Nazi warplanes in 1937 at the request of Franco and the Nationalists. The Nationalists, who wanted to create a homogeneous Spanish culture, detested the Basque who strove for autonomy. Guernica is regarded as the center of Basque culture, and therefore, it became the target of such horrific and unconscionable attacks. To this day, this oil-on-canvas mural reminds the Basque people of the toil they have endured to preserve their heritage. 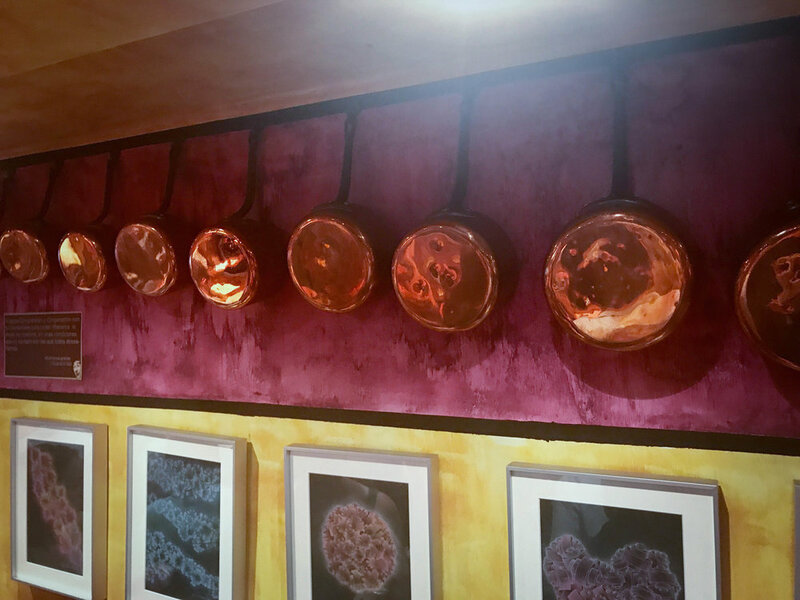 For our next stop we shuffled into the bar credited for creating the first-ever pintxo. This pinxto is known as the "Gilda" (pronounced Hilda), taking the name of a role played by Rita Hayworth, a famous actress in the 1940's. A simple yet delectable pintxo, the Gilda is a stacked composition of green olives, Iberian peppers, and salt-cured anchovies. You can find this classic bite at every pintxo bar, but nobody makes a tastier version than this family-run business. (We actually ordered ourselves another round because they were so tasty.) This family has fished for anchovies for over 140 years - that is literally generations upon generations devoted to anchovies! 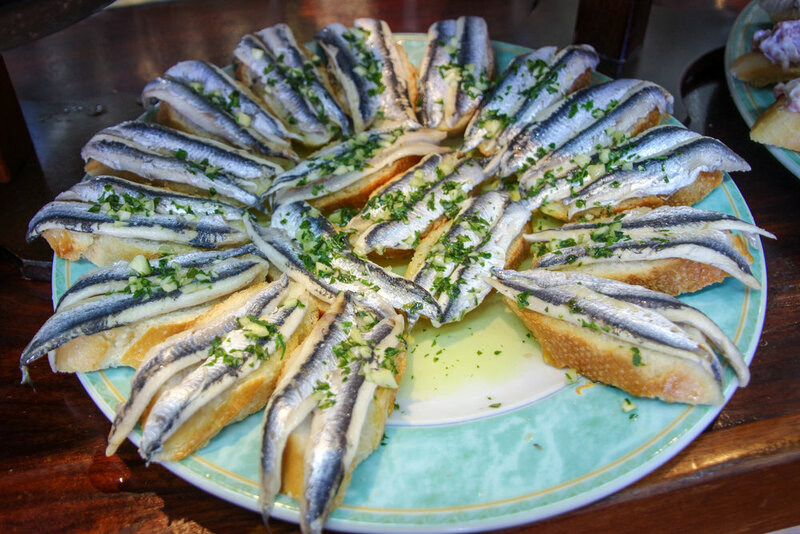 After devouring the Gilda(s), we tasted a small assortment of other anchovy-based pinxtos. First, we tried the anchovies placed atop a spider crab spread. Next, we tried the anchovies with black olives and spring onions. For "dessert", we tried the anchovies with blueberry jam. We questioned the madness of this concoction, but to our surprise this wild combination worked. The saltiness of the anchovies perfectly complemented the sweetness of the blueberry jam. This was one of the most unexpected and tastiest pinxtos I ate in San Sebastián. One pro tip we learned is that the best pintxos are made-to-order. Courtney guided us to another bar, tucked away from the main corridors for the tastiest tour stop yet. After dining here, I was not surprised to learn that the owners of this establishment run a Michelin stared restaurant, and that this bar is their pintxo concept. We tasted bacalou, or salted cod, which was re-hydrated and served abed a sun-dried tomato pesto with parsley and olive oil. Because the next dish was too tasty to share, we got our own plate the most succulent piece of crackling pork belly. The crisp and caramelized skin and a layer of saccharine quince jam sandwiched the perfectly cooked pork. We paired this dish with a glass of Rioja Crianza red wine. 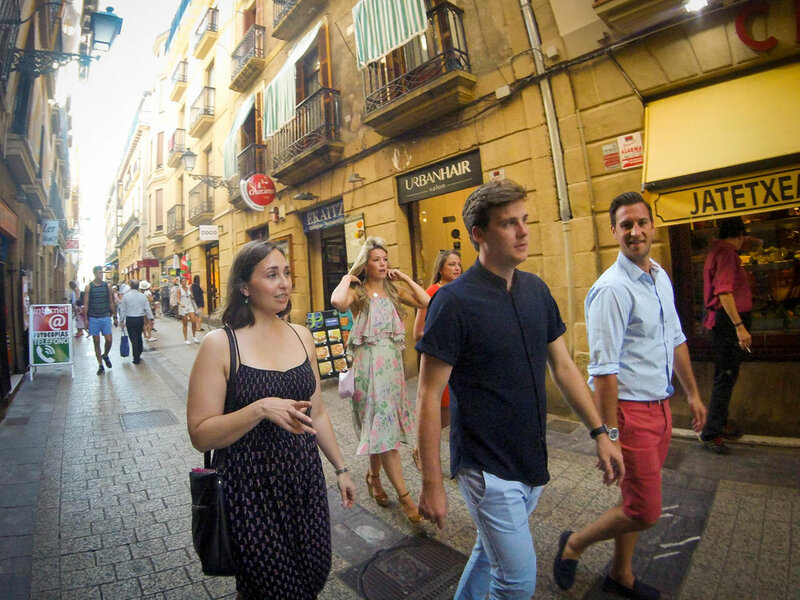 Attempting to walk off some pintxos, Courtney toured us around the gorgeous old city crafted from stone. San Sebastián has its own complicated history filled with pillaging, looting, and great fires that have wiped out half of the population. The city that we see today is actually a byproduct of the city's past terrors. Verdant countryside dominates the Basque country, creating an idyllic land for farming pasture-raised beef. Rounding off our pintxo-licious evening, Courtney sidestepped the pintxos left to linger on the bar mantle and procured the house-special: a made-to-order, sirloin steak pintxo. 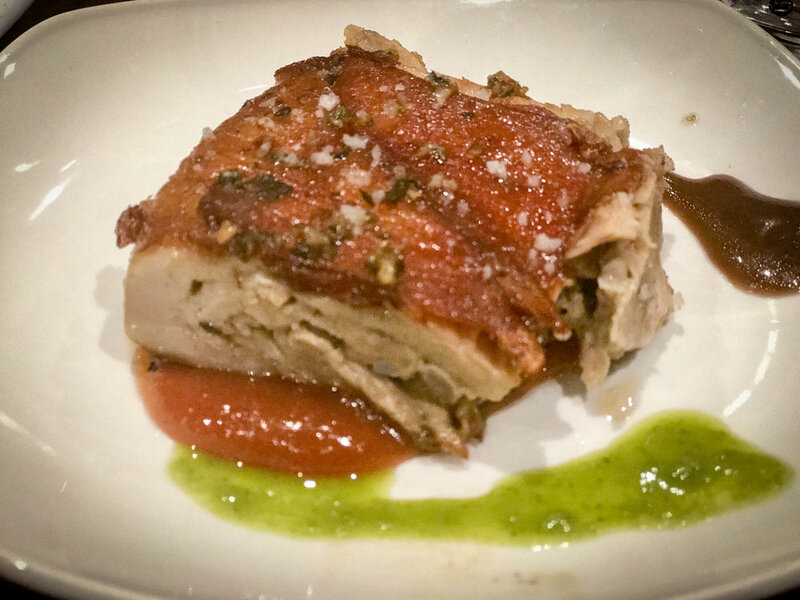 The elaborateness of this pintxo summarizes how the Basque love and celebrate the highest quality ingredients, no matter how small the bite. Basque people eat a lot and often. So even though we neared the point of satiation, we made room for dessert. We finished the tour off with the most luscious and divine cheesecake I have ever tasted. Other cheesecakes are cream cheese based and dense. Using a secret recipe, this shop twists the recipe and uses sheep cheese to create a gooey, custard-like cheese cake. We paired the cake with a sweet sherry wine, which we drizzled with little spoonful’s on top of the cake. We all received a generous slice of cake, and nobody left even a trace on their plate.